Munster once again, have qualified for the Heineken Cup Semi Finals, after what was a fantastic, heart stopping and nail biting game. From start to finish Munster were on fire, and they quenched any hope of European glory for Harlequins. In the lead up to the games, fans were nervous, Munster were written off, and many people felt that this mission was too much for the men in red. Harlequins had won all six of their games in the Heineken Cup Pool Stages, and were favourites to win the game. This didn’t phase Munster at all, and the passion pride and love for the province, the game and the jersey was evidence in Munster’s outstanding performance yesterday. Nick Evans was the first to score for Harlequins, and almost immediately after this O’Gara had the chance to equalise. His attempt hit the post and the score remained 3 – 0 to Quins. Moments later Evans hit a penalty wide, but redeemed himself when he notched another penalty on the twenty minute mark, which brought the home side 6 – 0 ahead. There were no signs of panic from the Munster squad, and Paul O’Connell continued to dominate the line-out. 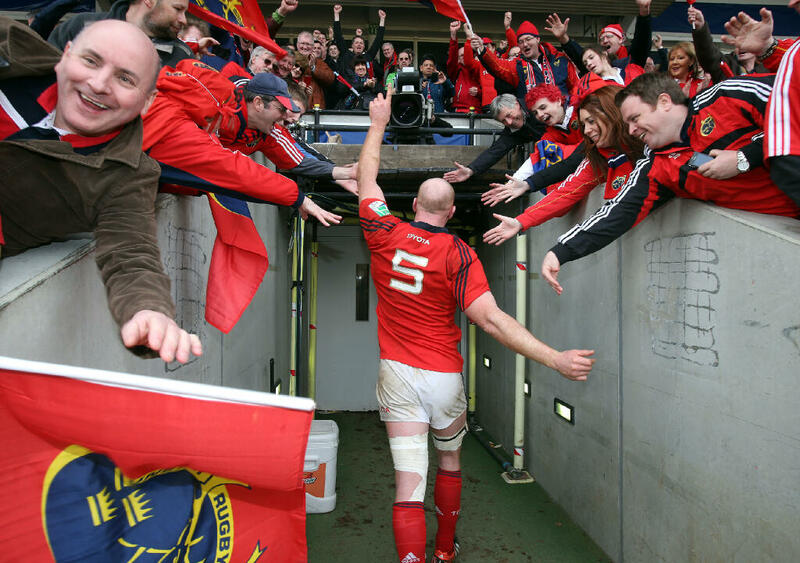 Munster fans in the Stoop were delighted when their hero dominated the line-outs, the pack and the pitch. He was phenomenal, and will no doubt have walked himself onto the Lions squad. O’Gara missed another chance a penalty when it went slightly wide on the 22nd minute. On the 25th minute he slotted the penalty over and Munster fans in the Stoop cheered even louder. A further penalty for each side brought the score to 9 -6 at half time. Munster fans watching were starting to feel quietly confident, and were counting down the moments to the second half. This game was turning out to be another epic encounter for the Irish squad. Munster came out in the second of determined confident, and all guns were blazing. They were on a mission – their mission was to dominate the game, rattle Quin’s and win the game, and boy did they accomplish their mission. From the get go Munster were the stronger team and shocked the Quins fans who were confident that their side would win. Moments into the second half Downey won a penalty for Munster, and O’ Gara made no mistake when he slotted it over, much to the delight of the away supporters Munster The score was now 9 – 9. From them on Munster came at Quins from all angles, and began to frustrate them. Penalties were given away by the English side, and O’Gara slotted them both. The away side now lead 15 – 9. On the 56th minute mark James Downey made his mark on the game again when landed a ferocious tackle on Mike Brown, which sent Mike Brown flying into last week. It will go down as one of the ” hits of the season” and is definitely one to YouTube! Munster continued to apply the pressure on Quins, and they conceded another penalty. Once again O’Gara slotted it over. The side were now 18 – 9 ahead, and with just twenty minutes to go, Munster fans were on their feet delighted to be present at another fantastic day for the province The Fields of Atenry rang out across the pitch as the Quins fans looked on shell shocked, at how the game was turning out. Nick Evans scored a further 3 points for his side on the 65th minute mark which brought the score to 18 – 12. There were only six points in it, and with fifteen minutes to go the game was still there for the taking . The final few minutes of the game were nail biting, but Munster held on, and the pack were remarkable. It was a well deserved victory and each player on the squad performed excellently. It was another very special day for the men in red. One of the best things about the day was the manner in which Munster responded to their critics, who should really know better than to write off Munster at this stage! Ronan O’Gara was once again superb, and answered any critics he had, and I for one was delighted for him. O’Gara was the subject of vile online abuse during the Six Nations by “keyboard warriors” who felt that they knew it all. I wonder would they brave enough to share their pathetic views today? The same goes for those who were unhappy with the Munster coach Rob Penney. In his first season he got Munster to a quarter final, despite losing numerous players through injury. If you look at the sides Munster beat in the pool stages, and look where they are now, it is something he should be proud of. There is a saying that I feel sums up Munster “form is temporary, class is permanent” O’Gara and O’Connell and the entire squad and coaches proved yesterday that they are indeed class. Their Heineken Cup journey continues, and promises to be a thrilling journey.